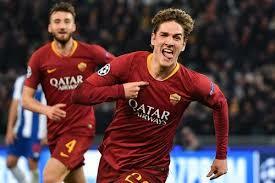 Two goals from teenager Nicolo Zaniolo earned AS Roma a 2-1 win against FC Porto in their UEFA Champions League last 16 first leg fixture on Tuesday. The 19-year-old continued his superb breakthrough season by finding the net twice in six second half minutes to become the youngest Italian to score two goals in a Champions League match. FC Porto substitute Adrian Lopez, however, quickly responded with what could prove to be a crucial away goal. The result ended a five-match winning run in Europe for FC Porto, who will welcome Roma to the Estadio do Dragao for the second leg on March 6.